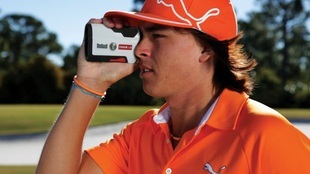 ​Nowadays, more and more golfers are using laser rangefinders to measure target distances on golf courses. Laser rangefinders help golfers develop their sense of distance by showing actual distances. Knowing exact distances under changing situations due to wind and a golf course's topography is not only a huge advantage for a golfer, but can help develop his or her golfing skills. When taking a measurement, a laser rangefinder emits hundreds of laser beams in an approximate half-second period to boost measurement accuracy, as a single laser beam can miss a target that is too small. Furthermore, when measuring the distance to a golf flag-stick, a rangefinder may also receive incoming signals reflected off trees in the background, in addition to signals reflected off the flag itself. To overcome this problem the best rangefinders provide a special targeting mode which when selected displays the distance of the nearest point, in this case the flag-stick, instead of the distance to the trees and bush in the background. The point-and-click operation of these rangefinders makes it simple and quick getting a perfect distance without slowing down the entire group while you look around for yardage markers or figure out how far you are from the green. With these devices, you can also point and shoot other objects, such as tree and rocks, if you are trying to gauge how much carry you have left. It takes all the guessing out of every shot. Yo just need concentrate on making a good swing. 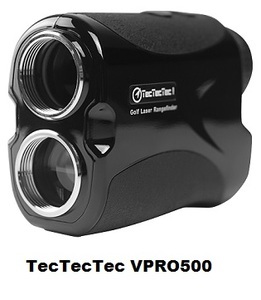 This article will compare TecTecTec VPRO500 and Bushnell Tour V4 golf laser rangefinders. These were not just the most popular among Amazon customers at the time this article was written, but they had also received excellent reviews from most Amazon buyers (an average of 4.5 stars each, out of 5 stars!). TekTekTek VPRO500 automatically powers down after 30 seconds of inactivity. 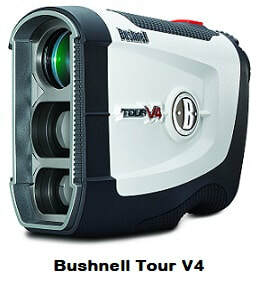 Bushnell Tour V4 automatically powers down after about 15 seconds of inactivity. While looking through the eyepiece, depress the power button once to activate the in-view LCD. Choose the targeting mode if required and the reading units (yard or meter). Align the aiming reticle with the target. Press the power button until the range reading is displayed. (To avoid errors the product manuals should of course be carefully read before using these rangefinders for product specific operation details). NORMAL mode is used to focus on any target. You simply align the reticle with the target and press the power button to display the distance. SCAN mode provides continuously updated range information for the various objects the laser hits as you pan across landscape. PIN mode, also known as “First Target Priority Mode", gives you the distance to the flag despite multiple objects that maybe behind it and that may have stronger signal strength. PINSEEKER mode allows easy acquisition of the flag without inadvertently getting distances to background targets (i.e. trees) that may have stronger signal strength. JOLT feature allows you to enable a vibration signal (similar to setting a cell phone to “vibrate”) that will be felt when the Pinseeker feature indicates the flag has been detected and the distance to it is displayed in the LCD. Both rangefinders allow to select yards or meters as the unit of measure. Exit pupil is the diameter of the light beam exiting from the eyepiece. Exit pupil should be a little larger than your pupil, but too large an exit pupil is useless, because the eye will not be able to collect all of the light. Also a wide exit pupil will increase the device weight and dimensions which is not particularly desired for a rangefinder. Eye relief is the distance the binoculars can be held from the eyes for comfortable observation. This distance is important if you wear glasses. Long eye relief design affords eyeglass wearers easy viewing. Multilayer coatings provides an even higher light transmittance across the entire visible light spectrum and facilitates bright and clear images. Water resistant does not mean waterproof. So do not immerse these rangefinders in water! If any moisture is found on movable parts of the unit, stop using it, and wipe it off. CR2 Lithium batteries allow continuous operation approximately 8,000 times (at approx. 68°F). This figure may differ according to condition, temperature, and other factors such as target shape, color, etc. However, due to natural electric discharge, the life of this battery will likely be shorter than this specification. The diopter adjustment is a control knob designed to adjust the eyepiece to obtain a clear image in the LCD. It allows one to focus the LCD display relative to the image. To adjust, simply rotate the eyepiece until the reticle and the target object are both in focus to your eye. If the diopter is not adjusted to correspond to your eyesight, you may not be able to correctly aim at your subject. TecTecTec also has a 30-day money back guarantee. The Amazon prices shown here were in effect at the time this article was written and may have changed. For exact prices, please refer to the Amazon products section below. Note that the Amazon price often includes a generous discount to the list price. If a discount exists, both the Amazon price and the list price will be displayed when you click the Amazon product link images below. So which of the two rangefinders to choose? The two laser rangefinders considered here are excellent products as shown by the average rating each had received from Amazon customers at the time this article was written. 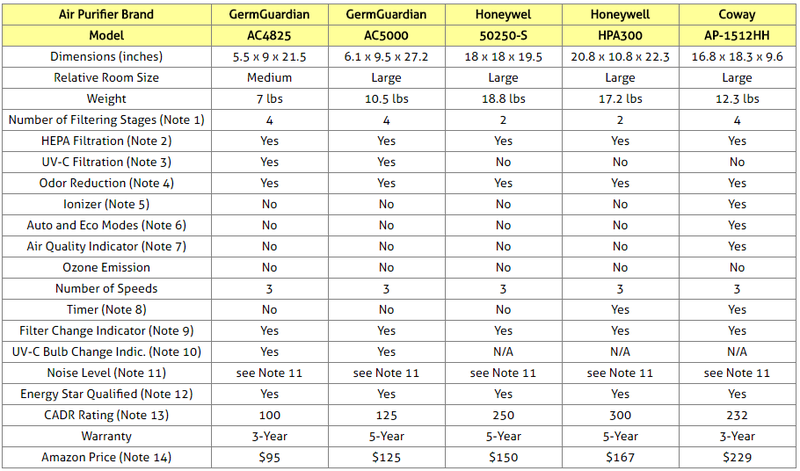 Indeed, both TecTecTec VPRO500 and the Bushnell Tour V4 had received 4.5 stars (out of 5 stars)! There is a good chance that you would be quite happy with either product. TecTecTec VPRO500 is very well built, has compact size, very simple to use and accurate within 1 yard. It has just two buttons on top of the device. The POWER button turns the unit on, and when depressed and held down, it gives the yardage almost instantaneously. ​The MODE button switches between meters and yards and selects the targeting mode. It has excellent clarity with 6x magnification, and it shuts off automatically. It also comes with a case which can be worn on your belt or attached to golf bag. Note also that the TecTecTec customer support is simply excellent! ​The only negative point about this product that Amazon users have expressed is that both the rangefinder unit and the case are black. And because most golf carts have a black interior, it could be easy to forget. Users have expressed a desire for a more splashy colored case. Bushnell Tour V4 Jolt is also small, accurate within 1 yard, and extremely easy to use. It operates from a single button to identify the target, and it gives you a slight vibration when it locks on the target. It has lightweight design, bright viewfinder, good optical offset (for those who need to use it with glasses) and the pin-seeker feature that gives you a confirmation you have something pin-like in your sight. The vibration feature when it acquires the flag is a great addition. It ensures that you are measuring to the flag and not to a tree or some other object. It will give you your measurement down to the yard and help with club selection to get as close to the hole as possible. It can also be used for other targets to get an indicator of how far you are to a creek, bend, etc. ​It's easy to transport and has a handy carrying case to hook onto your golf bag for easy access before pulling a club. It fits easily in one of the side pockets of your golf bag or you can leave it hooked on the outside of the bag safely. Note though that this rangefinder has 5x magnification as opposed to the 6x that comes with the TecTecTec. Although this device costs a bit more, it's worth the investment. The build quality is exceptional, and you will feel that it will be in your bag for many years to come. Note also that as opposed to the TecTecTec rangefinder which is black, the white color makes it quite difficult to forget in the cart! Please click the laser rangefinder of your choice below for price information or to purchase. Slope Rangefinders calculate and adjust the distance readout depending on the degree of the slope.